Ghoulish Steampunk Dimensional Human Skeleton Head is posing with a long-stemmed Rose in his gruesome teeth, ready to rock! Creepy Antiqued Silver Color Heavyweight Resin Switchplate Halloween Haunted House Home Haunt Prop Decoration. 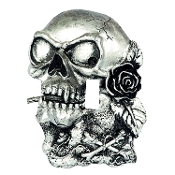 Gothic rocker biker style SKULL Light Switch Cover is a super cool teen room or man cave accessory year ‘round!